Another similarity to Broad: Before Norton Simon’s takeover of the Pasadena Art Museum, Simon had intended to establish his collection as a lending organization. Taking control of the Pasadena Art Museum proved irresistible to Simon, and today the Norton Simon Museum rarely loans works. I seriously doubt unfounded rumors that Broad has some kind of evil master plan to takeover or somehow combine his collections with MOCA. 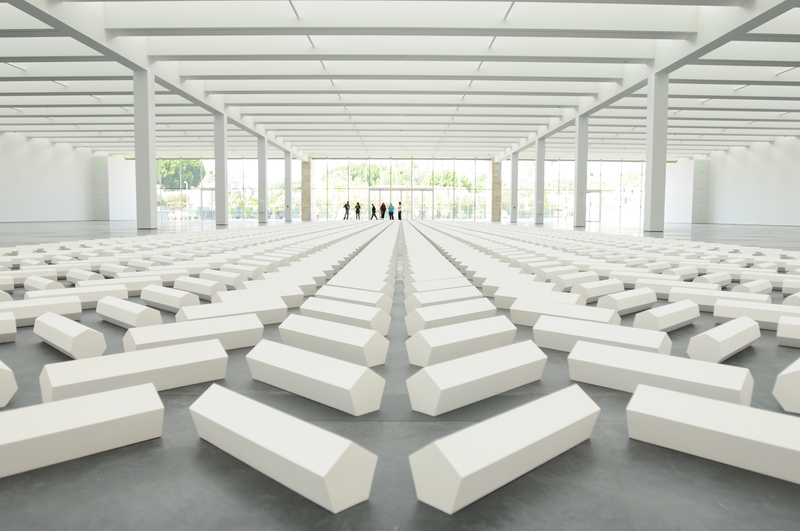 Walter De Maria’s “The 2000 Sculpture” installed in the Resnick Pavilion. Broad can also be measured to his contemporaries. Los Angeles is not actually a one-philanthropist town. “Pomegranate Queen” Lynda Resnick is an easy comparison. 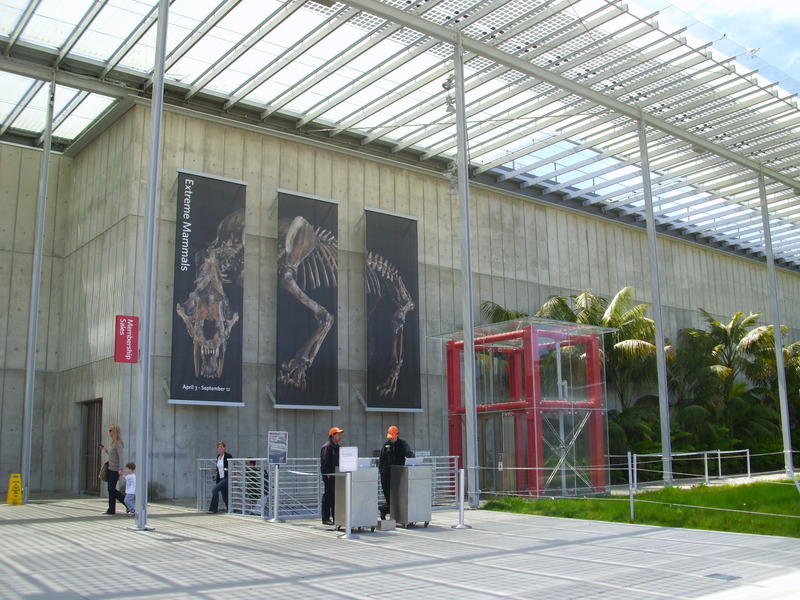 Like Broad, Resnick is a long-time donor and trustee of LACMA. Like Broad, she and her husband provided funds ($54 million) for a Renzo-Piano-designed building at LACMA. The Lynda and Stuart Resnick Pavilion was part of Phase 2 of LACMA’s Transformation and sits directly north of BCAM. When the pavilion opened in October of 2010, one of three inaugural shows was gleaned from the Resnick’s private collection. What is 70 feet long, suspended by a 160-foot-tall crane, and will cost an estimated $25 million dollars?—Jeff Koons’s Train, of course. The massive sculpture is now several years along in planning; its realization prolonged by several factors. The most retarding factor: the economy. 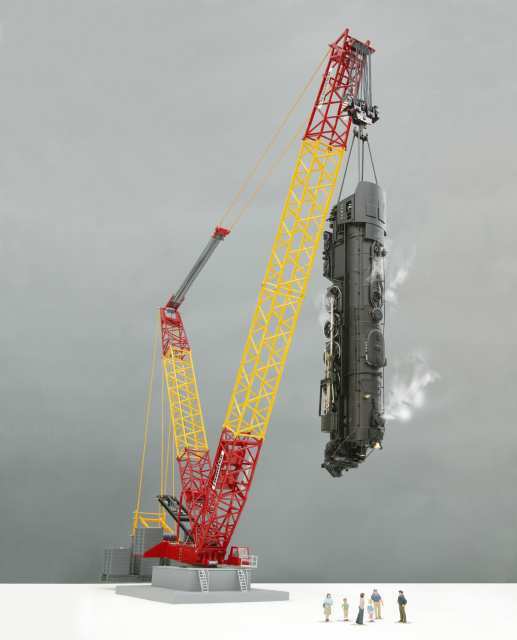 When and if realized (a big “if”), Train will consist of a replica 1943 Baldwin 2900 steam locomotive hung on its end by a Liebherr LR 1750 lattice-boom crane. Twice a day the train’s engine will hum to life, pistons will churn, wheels will spin, and finally jets of steam will explode from the train’s stack , while its whistle screams. Considering its authorship and this suggestive action, it is easy to read Train as a giant orgasmic metaphor. Letting off some steam: model by Koons. As promised in my post about the new pavilion at LACMA which bears their names, I present to you the fabulous Lynda and Stewart Resnick. 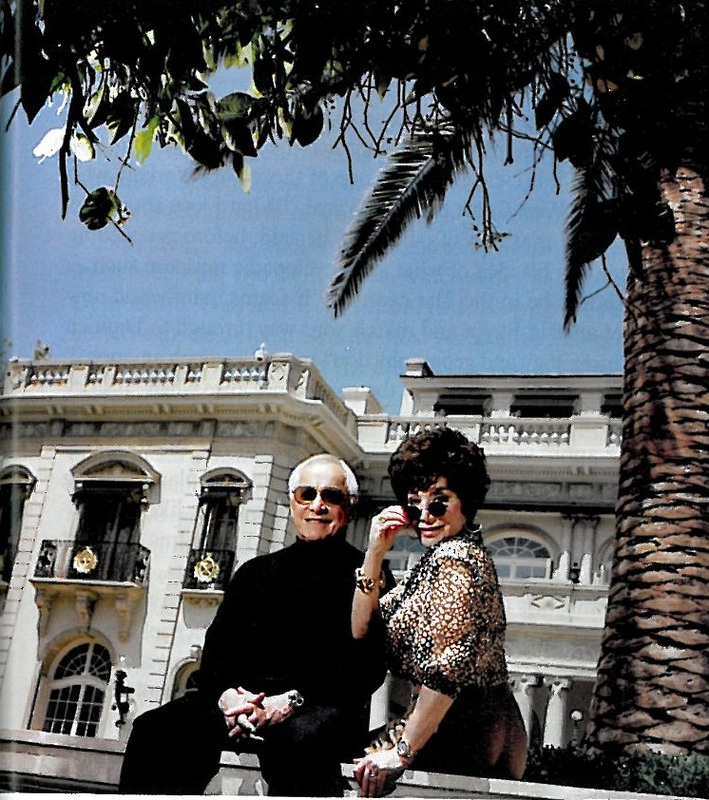 How glamorous is this picture!? I’m going to admit it right now: I love Lynda Resnick, she’s the pomegranate queen after all, and her fashion choices are daring and faboosh! This post is getting pretty gay, but I’m trying to insert a bit more personality into these posts (while at the same time not going over the top homo). Carrie Bradshaw moment: Hello, Lynda Resnick lives here. And let’s take a look at that Sunset mansion she is so lounging in front of. It’s hard to find great shots of this house, but there are some aerial and street shots, and I’ll never pass up an opportunity to link to Curbed LA. Oh and one of the three inaugural exhibitions in the Resnick Pavilion is from their collection—Eye for the Sensual. I bet my bottom that Lynda Resnick does indeed have an eye for the sensual. Below are some works from their collection. Francois Boucher’s Leda and the Swan, sensual indeed. Okay I know I’m going into a tizzy about Lynda Resnick, but really the woman is pretty amazing. She’s been massively successful in her public relations business (oh hey I’m an Annenberg Public Relations program graduate), and is even pretty suave with the social online media, she has a blog and of course a twitter. “Warring Angeles” not my words. Above is a full page spread featuring some of the characters involved in this saga as told by Vanity Fair. Look, Michael Govan’s daughter loves the Robert Irwin palm garden! Based on these photographs I’d much prefer to housesit for the Resnick over the Broads. I’ve always found that Jeff Koons Rabbit really, really terrifying. Can you image living with that thing? 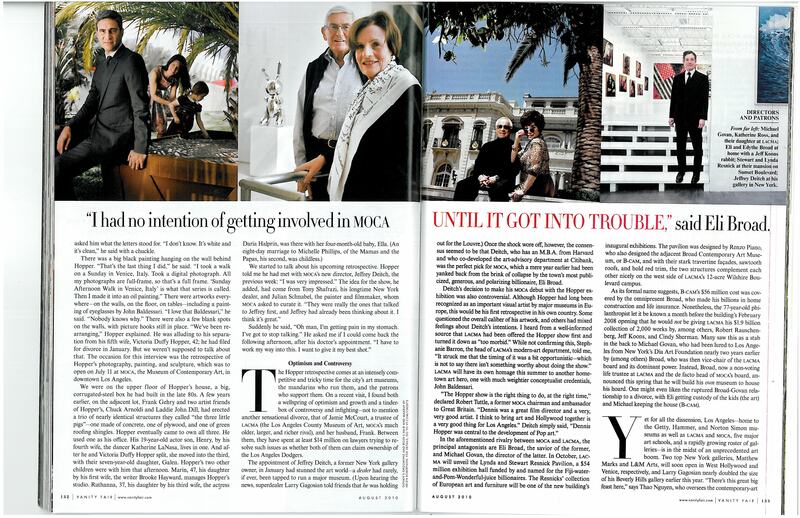 Oh, and some more press about Deitch as the new director of MOCA. As if no one had heard the news. Recently I took a trip north to San Francisco and of course I visited a few museums. The next few installments of Exhibition Inquisition are going to be about museums in Norcal, this is a way to gradually wean you off of Los Angeles reviews, as I will be moving to Chicago in fall. Also notice to Chicago: here I come. I didn’t just visit art museums during my trip north, but also visited the California Academy of Sciences in Golden Gate Park. I had been to the academy numerous times as a child, but hadn’t been since the Renzo Piano renovation had opened. Of course Renzo Piano is also the architect of the BCAM at LACMA, and the soon-to-be-opened Resnick Pavilion, also at LACMA. The architectural comparisons are fairly obvious: dominant cement and glass materials punctuated with accents of firetruck red. The elevator at the Academy is of a twin of the one at LACMA. Other than the obvious the Piano’s process of acknowledging the function and purpose of the building, and allowing that to dictate the form and design of the building. Critics aside, BCAM operates as it was supposed to: a white cube for the display of contemporary art. The Resnick Pavilion will do the same: a warehouse for creating temporary spaces for temporary exhibitions. The Academy of Sciences works the same way. 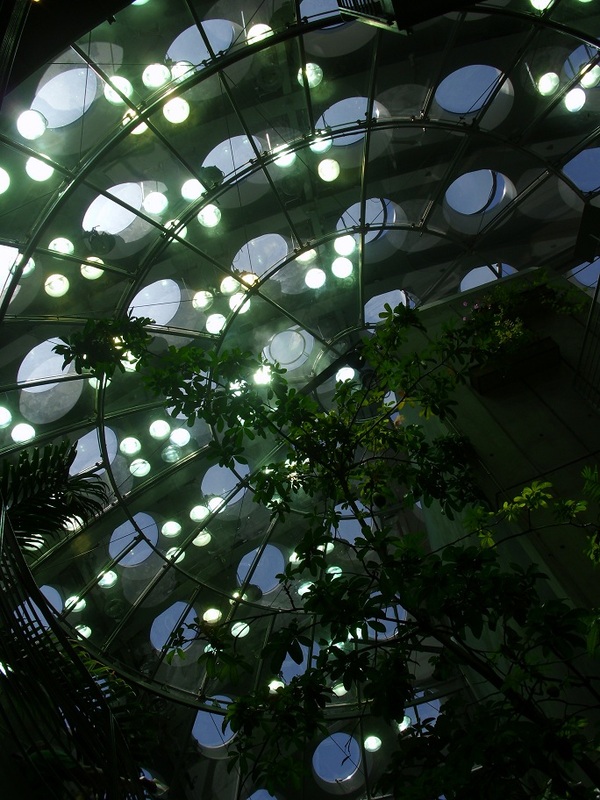 The building is dominated by two large spheres (one is a planetarium, and one holds an indoor rainforest) whose forms are embraced by the roof of the building. This can be seen in the architectural sketch by Piano. 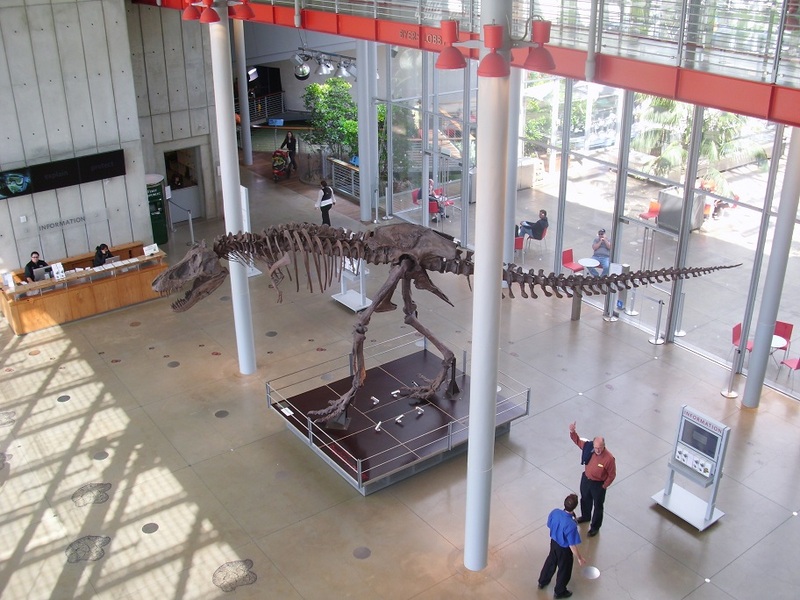 The entry space is dominated by a large T-Rex skeleton. I thought it was noteworthy that even in this contemporary space that looks nothing like a traditional museum, some vestiges were left, like the dinosaur skeletons being the first thing one see as they enter. Behind this was an open air piazza that is nestled in-between the two orbs. 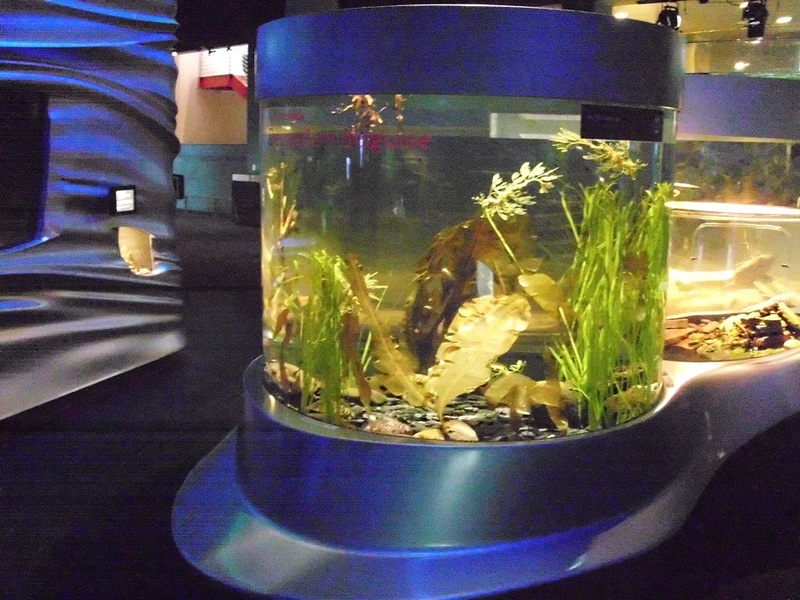 Around the two large spheres is water; a visitor has to go below ground level to understand that the water goes many feet below and is actually the top of several large aquarium tanks. The building is a shrine to the sciences full of specimens and takes every opportunity to educate. Literally no space is left unoccupied by something thought-provoking or beautiful. I can’t believe Claude is still alive! Old favorites are still around. 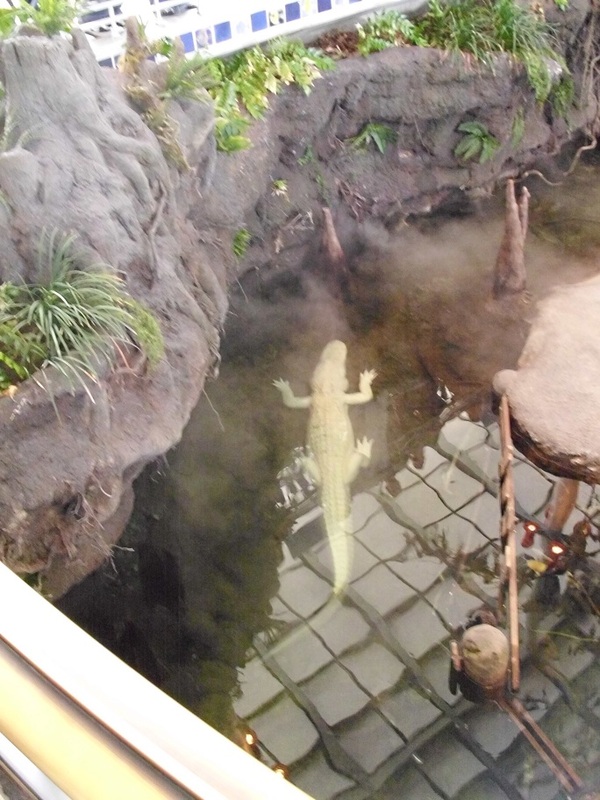 The biggest celebrity of the academy is the extremely rare albino alligator named Claude. 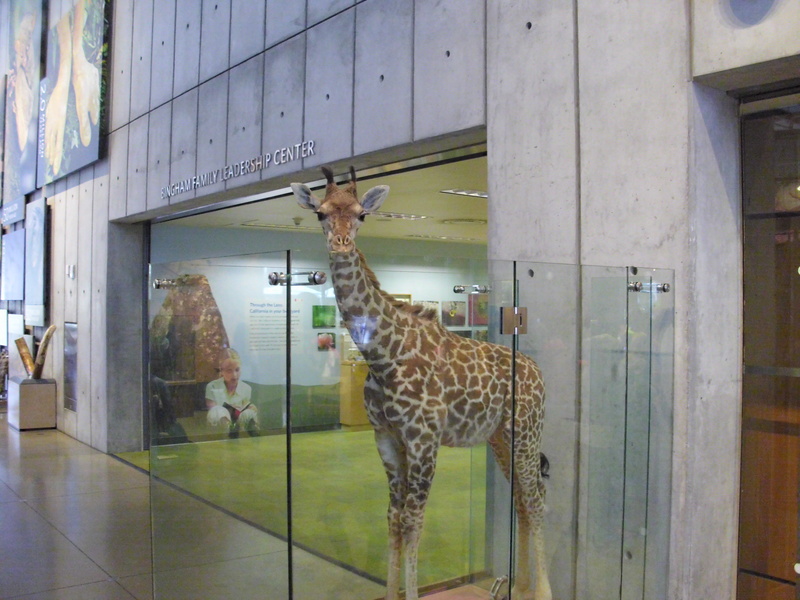 I remember seeing this baby both at the original academy and at the San Francisco Zoo at one point in time. The old white guy was return to an enclosure that is fairly similar to the original. 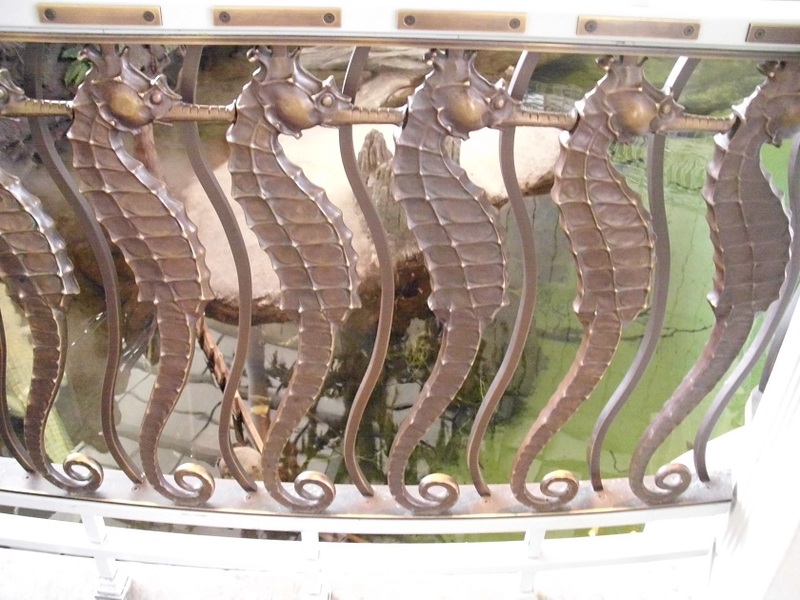 Around the top of the case is a fairly tacky railing made up of bronze sea horses. The sea horses are one of the details from the original building that were left intact. A docent of the Academy (who knew my father, because my father knows literally everyone in the Bay Area) told me that his father was the artist who created the sea horses. Below ground level was the aquarium space, which I have to say was not my favorite. Strikingly similar to the Pardo-designed display cases in LACMA’s Pre-Columbian galleries, were some smaller sized tanks filled with various species. Curvatious glass forms refracted the light and distorted the forms of the sea creatures within giving them a freakish fun-house mirror effect. 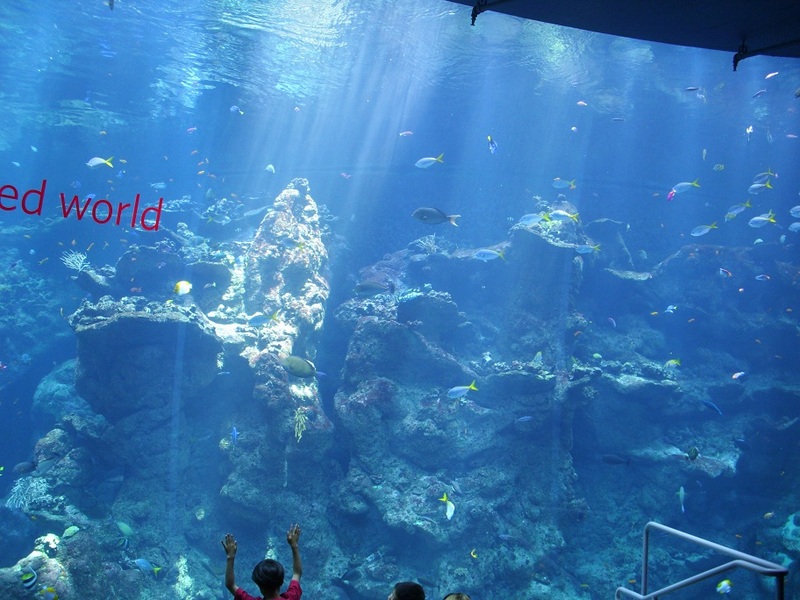 These smaller cases were accompanied by the large tanks full of many schools of fish, which were separated into several climates and locations. I got thirsty while on the aquarium level and was amazed to find that even the act of drinking from the water fountain had been turned into an educational experience. The Academy took this moment to inform me about the benefits of tap water versus bottled water. 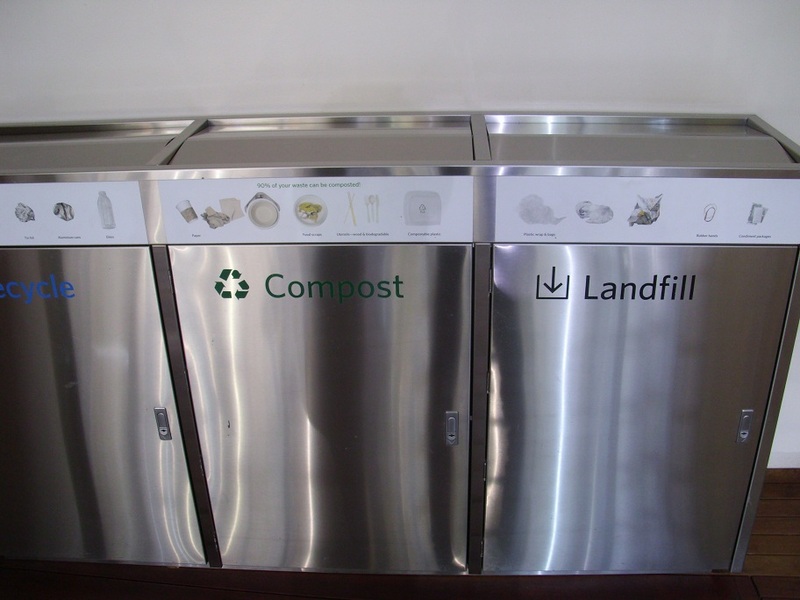 This was similar to the moment I had when throwing away a piece of gum, where I was greeted with information about recycling which was mounted on the various trash and recycling cans. Do you know where that gum wrapper is going to end up?—I do. Back upstairs are the more traditional displays of taxidermied animals, mostly mammals from Africa. Some oldies are still goodies. 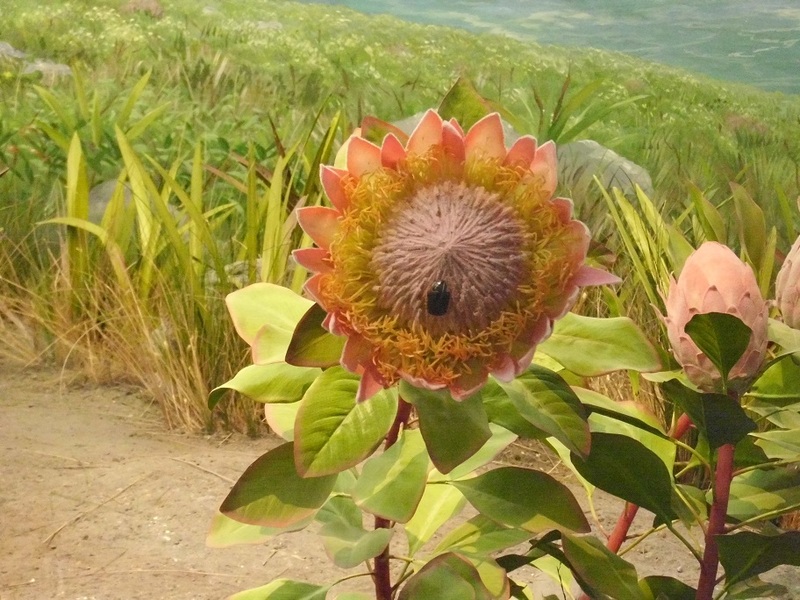 I was absolutely astounded by the amount of detail that had executed in these display cases, in one scene flora surround the fauna but are given as much attention, including a beetle that seemingly meanders across a flower. The tableaus of frozen wildlife were mixed with staggered cases of live specimens and cases displaying only skeletons. At the end of the hall was the ever popular penguin display, which gets crowded several times a day during feedings. 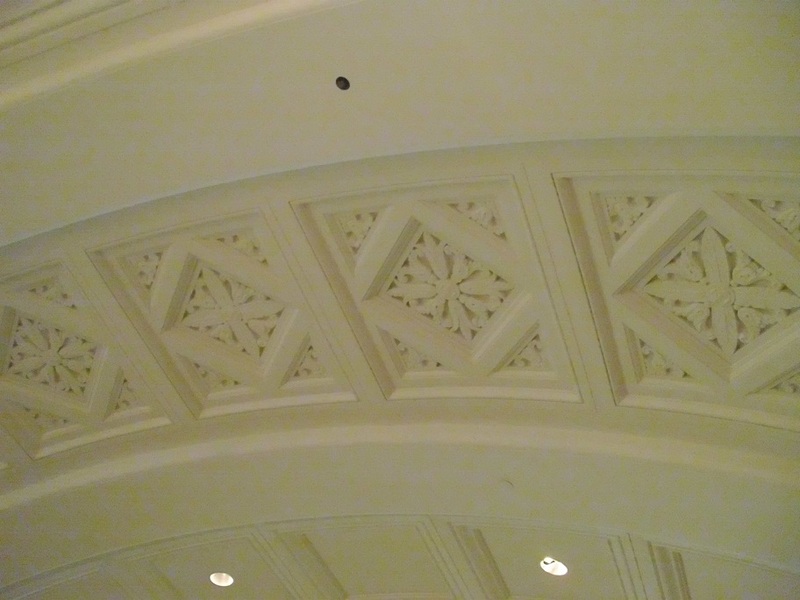 The coffered ceiling of the mammal hall had been preserved much like the seahorse balcony. The ceiling had been livened with a coat of fresh white paint, but the arched barrel vault remained. 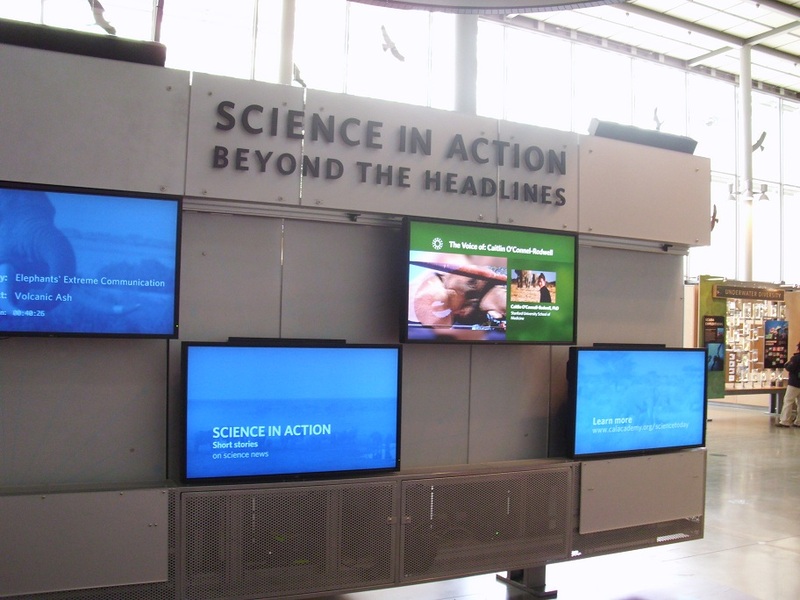 Outside of the mammal hall is a crowded space full of smaller displays covering an array of topics including evolution and the Galapagos Islands. One space that was getting a lot of attention from the kids was a media center that just played newsworthy pieces on several gigantic screens. The media space was set in front of an audience of mostly empty chairs; this seemed to be the place the grandparents took a quick break from the screaming masses. Next it was time to explore the rainforest dome. This portion of the visit required waiting in line as only so many visitors are allowed in the climate controlled dome at once. I was wearing a jacket and scarf the whole day at the museum, but quickly removed them once inside the rainforest dome. Inside is a whole different world, you enter at the ground level and slowly work your way up so that you can experience the different sub-environments. Birds and butterflies perch and swoop through the air all around the dome. Visit just for this, because really, when is the next time you’re going to be in an Ecuadorian rainforest? 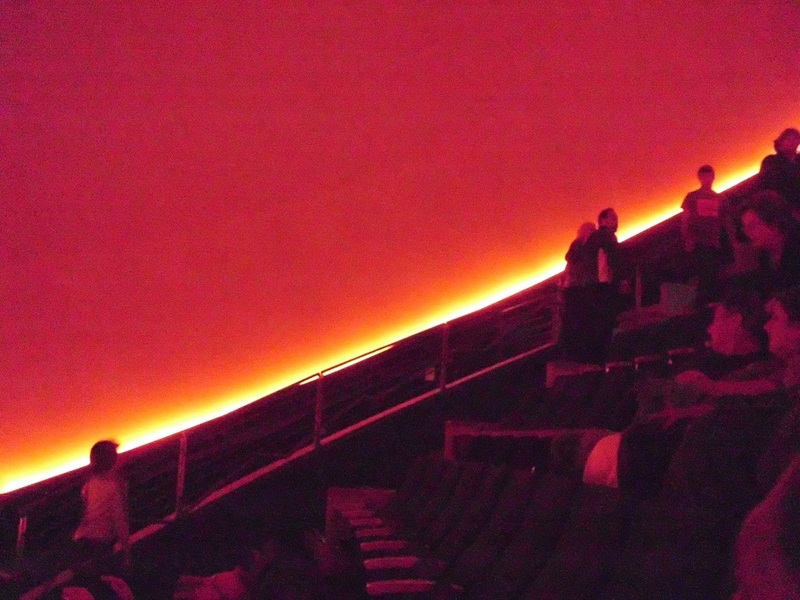 Then it was time for the planetarium show, which took place inside the other dome. The curved space was all encompassing and would have been a very serious experience had the documentary movie not been narrated by Whoopi Goldberg. I have to say I did prefer Whoopi to Oprah on the Life series, but that is mostly because whenever Oprah talked about mating I got creeped out. The visit wasn’t over until we went to the roof of the building. 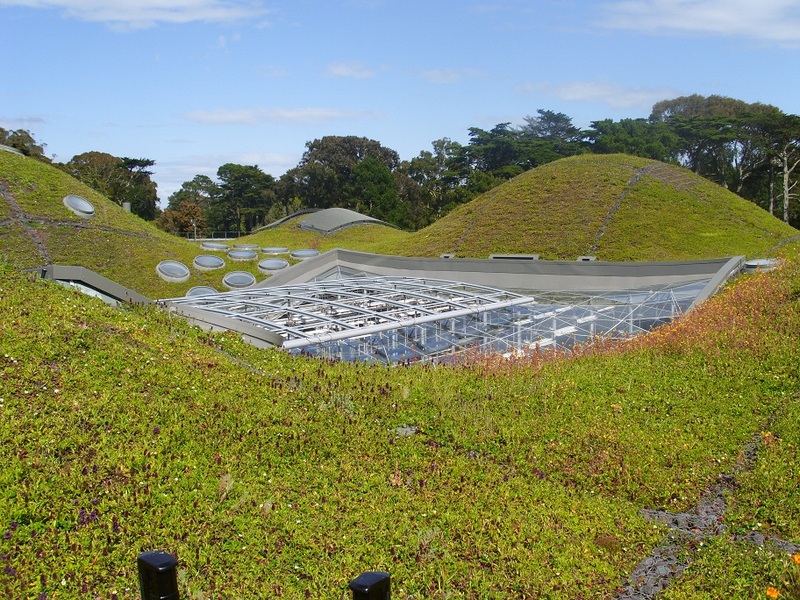 Yes the roof looks like the set for the teletubbies show, but it’s actually a very practical and environmentally sound usage of a roof. I can’t even begin to explain how amazing this roof is, but there is a lot to say and the Academy tells you most of the information on placards surrounding the accessible portion of roof. All in all the new Academy of Sciences was everything I hoped it would be, so education, and yet so full of wonderful surprises. The building and its architecture makes an exclamation point to the statements within about recycling, global warming, and climate change. Even though I tried to see everything in one day, I’m sure each time I go back I will see and learn something new. Below is a slide show of additional photos, since I feel like I couldn’t explain everything in this one post. P.S. How could I almost forget about the actual art installation at the Academy?! 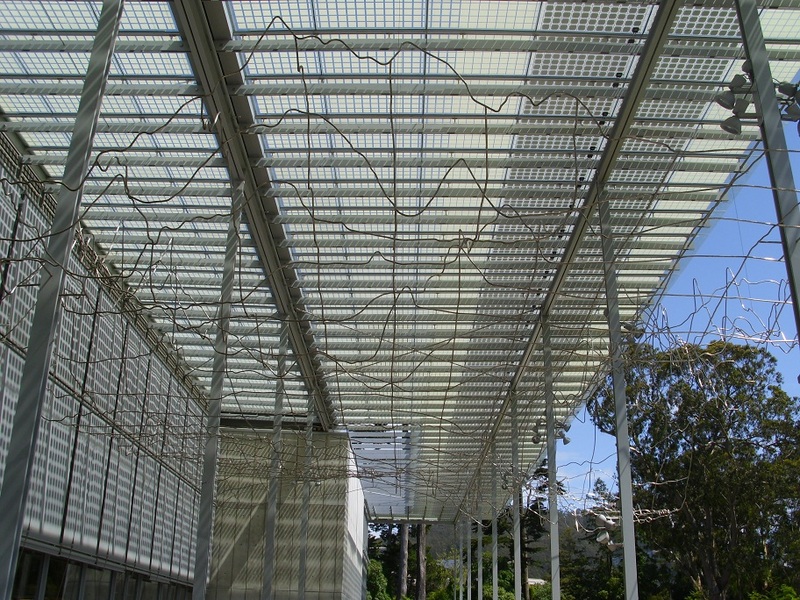 A few years back the De Young Museum, across the way from the Academy, organized a show of Maya Lin’s artworks. Linn who is most famous for the Vietnam War Memorial in Washington D.C. works in a variety of media. One of the last works in that exhibition, called Systematic Landscapes, were the preparatory sketches and designs for an artwork that was going to be installed at the Academy of Sciences once it reopened. This work is called Where the Land Meets the Sea, and it hangs outside the Academy. The works is made up of a grid of seemingly randomly bent and twisted wires. The work actually is an exaggerated topographic map of a portion of the San Francisco Bay. Some of the high and low points have distinguishable references, like Angel Island. This artwork is simultaneously aesthetically beautiful, and would be appreciated without knowing what it represents or what inspired it, but upon further self-driven exploration is really an education tool. Job well done Academy of Sciences!